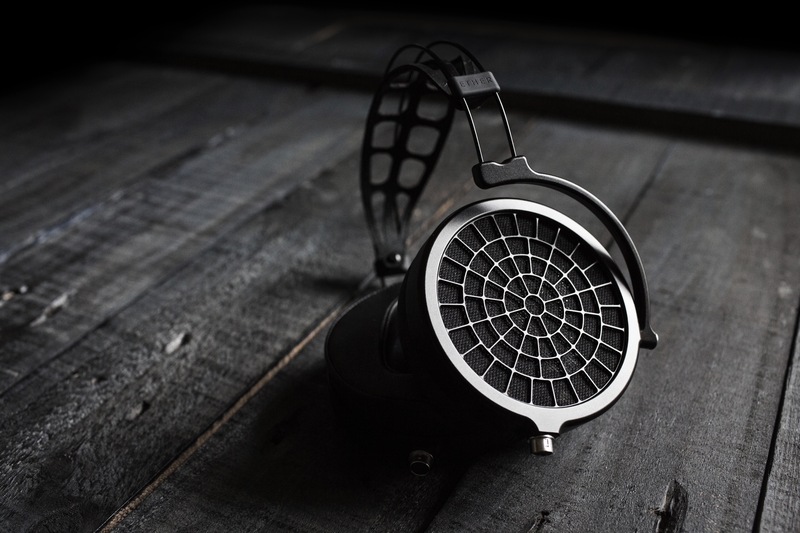 MrSpeakers ETHER 2 is their flagship planar magnetic headphone. Phonzerelli and HK_sends like this. DISCLAIMER: SLT Technologies (MrSpeakers’ distributor in Indonesia) loaned me the ETHER 2 in exchange for my honest opinion. I will send the headphone back following the review. I am not personally affiliated with the companies in any way, nor do I receive any monetary rewards for a positive evaluation. I’d like to thank SLT Technologies and MrSpeakers for their kindness and support. The review is as follows. MrSpeakers is a headphone manufacturer I’ve had the pleasure of knowing since their humble beginnings. Founder Dan Clarke initially started the business by jumping on the Fostex T50RP mod-fest. The resulting Mad Dogs, Alpha Dogs and Alpha Prime (which I still own to this day) became widely known as the best-sounding of them all. He’s since gone on to develop immensely successful product lines infused with his own technologies, including the ETHER and AEON families. But, if one were to ask Dan what his most meaningful creation was, his answer would probably be VOCE. MrSpeakers’ bid into the electrostatic space, the VOCE also inspired many of Dan’s most recent innovations – including TrueFlow. 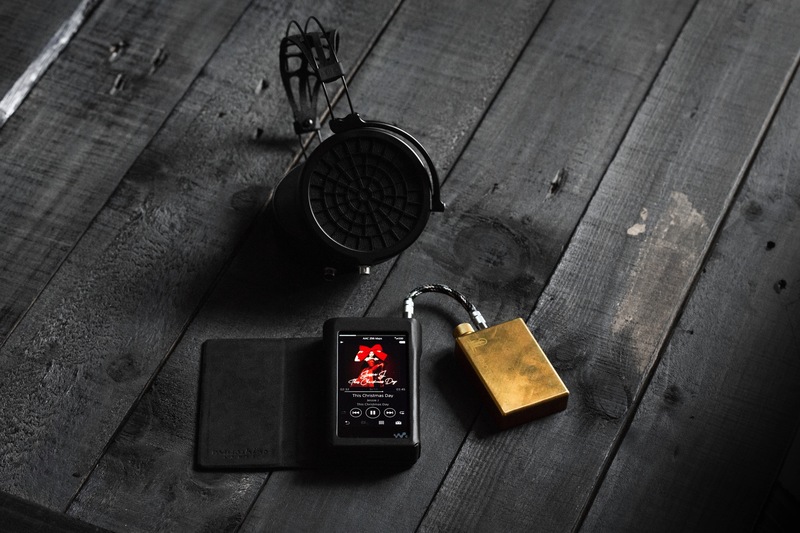 It’s no surprise then, that MrSpeakers’ latest flagship bears a striking resemblance; a dark twin, almost. Dressed in a slick matte black, Dan premiered the ETHER 2 at RMAF 2018 – the culmination of everything Mad Dogs to VOCE in the flesh. The ETHER 2 I’m reviewing is a demo unit from SLT Technologies, so I received it without its retail packaging. 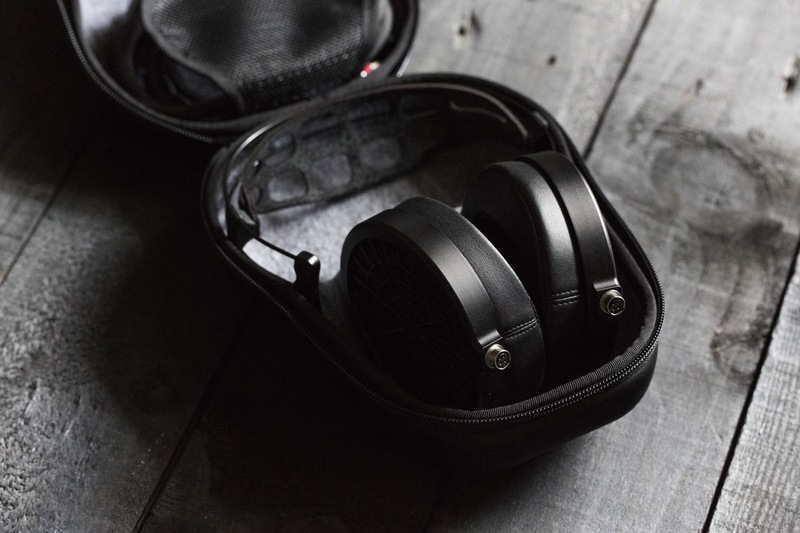 Regardless, it does come with the company’s signature, heavy-duty, clamshell case – equipped with a zipper, fabric-lined walls and moulded structures to keep the headphones stationary in transport. There’s also a net-like compartment to store cables and accessories. It’s a clever deterrent against the connectors bouncing around and scratching the headphones too. For a flagship at its price, one wouldn’t be slighted for wanting more in the accessory department. 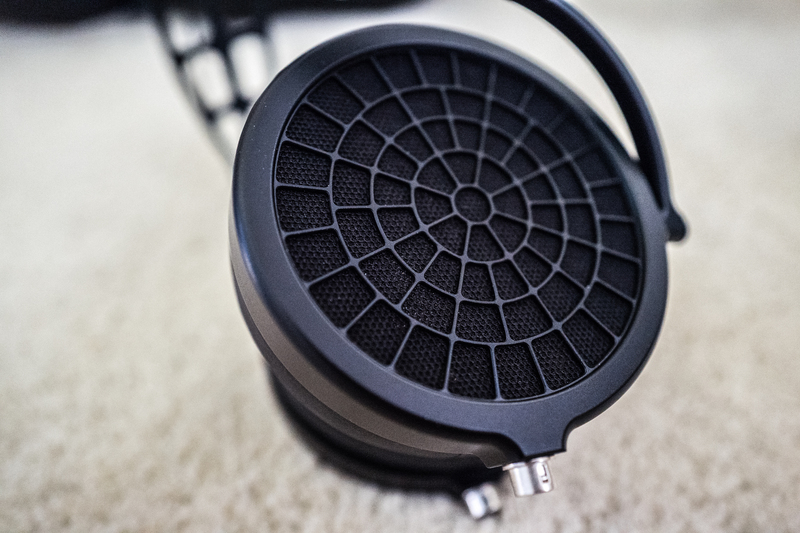 Perhaps a cleaning cloth or MrSpeakers’ signature tuning pads could’ve been nice touches. But, they do offer a special edition with a signed display case and headphone stand at a $500 premium. So, I at least appreciate the option they’ve given for a less costly, streamlined variant of the product. And, those who want more luxury with their flagship can have their cake as well. It’s clear however that Dan and co. did not cheap out on the headphones whatsoever. The ETHER 2 sports an all-metal design and a carbon fibre driver baffle – ensuring durability and longevity. The headband’s received a redesign – now more net- or web-like. This reduces the contact area between the material and the head, so the top of the head remains breathable and cool. Although one might criticise this change for weight, that should be the least of your concerns. 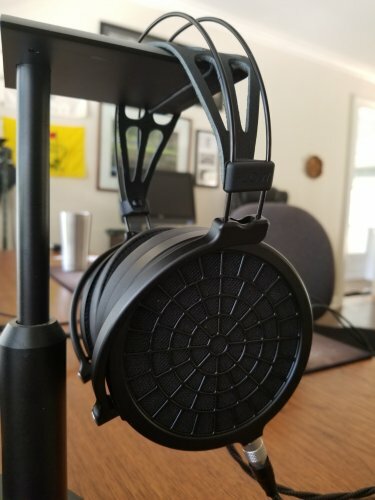 MrSpeakers’ ETHER 2 is the lightest flagship I’ve ever used. At 289 grams, it’s surely an industry benchmark. Finally, the headphones are finished in matte black for a sleek aesthetic, with zero chips or squeaky bits to speak of – pure class. The company’s fantastic NiTinol headband makes a welcome return, allowing the headphones to contort unrecognisably before returning to their original shape. This ensures the headphones don’t produce any extra pressure or strain, and maintains the headband’s lifespan as well. For smaller heads, the webbed inner-headband can easily be adjusted to fit your needs. But, for larger heads like mine, there isn’t as much leeway. My noggin certainly stretches the headphones to their near-limits, and it would’ve been nice to see a greater degree of customisation on that end of the spectrum. The synthetic protein leather ear pads, while plush, are a tad low-profile as well. But, I’m sure this specific girth was chosen for sound, and the pads as they are are extremely plush, gorgeously made and breathable too – no complaints there. V-Planar technology is something Dan Clarke developed in conjunction with the Alpha Prime. In essence, Dan argued that a flat, planar driver would not be able to vibrate uniformly along a flat plane. Because of the material’s inelasticity, the diaphragm would actually bow as the audio signal rocked it back and forth. What V-Planar technology does is introduce deep, v-shaped creases along the driver’s surface. So – especially in larger excursions – the driver would be able to expand and contract as needed with zero strain to the material. Dan claims an increase in dynamics, high-end extension and measurably lower distortion, along with the diaphragm’s ability to push more air at lower frequencies. TrueFlow technology was developed much more recently. While developing the VOCE and investigating the differences between electrostatic and planar magnetic headphones, Dan discovered a flaw in the latter’s design. 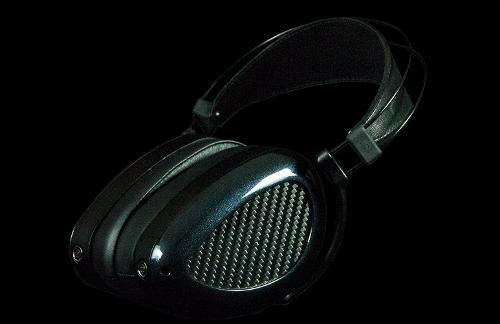 Planar magnetic headphones – as the name indicates – require the presence of a thick magnet array on at least one side of the driver. The inherent shape of those magnet arrays often impede the movement of air – and therefore, sound waves – from the diaphragm to the listener’s ear. They’d have to make right-angled turns, which introduce diffractions and reflections, i.e. distortion. What TrueFlow does is introduce perforated waveguides in those magnet arrays to smoothen the flow of air as much as possible and dampen any refractions – resulting in superior resolution, dynamics and frequency extension. Dan and co. have absolutely made huge strides as far as cables are concerned. The all-new, silver-plated-OFHC-copper VIVO cable is a far cry from the ETHER 1.0’s stiff, coarse and unwieldy DUM cable. Ergonomically, the former is infinitelysmoother, softer and more pliable. There’s perhaps a touch more thickness and weight, but it’s barely consequential. 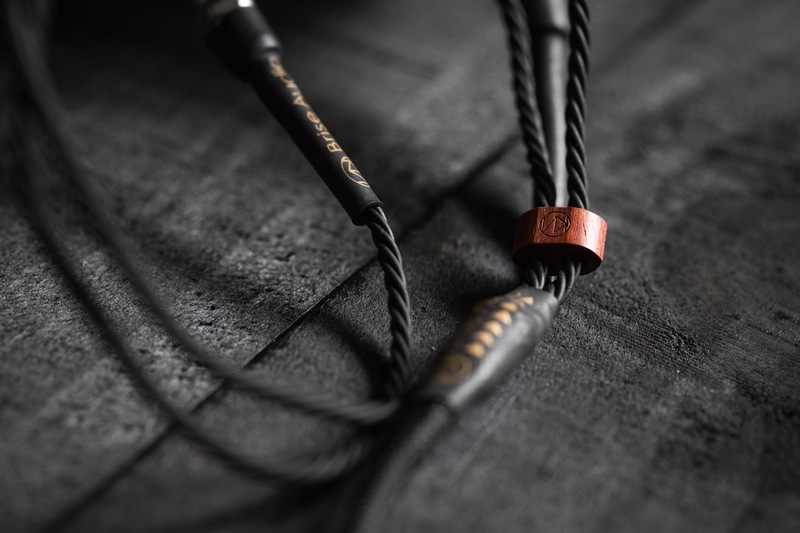 Once again, MrSpeakers have employed their excellent HIROSE connectors – my favourite in terms of security and ease-of-use. The woven, cloth-like insulation heavily resembles the AEON Flow’s stock cables. But again, the VIVO cables are a hair thicker. Sonically, I wasn’t able to compare the VIVO cable against them because of termination differences. But as seen in the Synergy section, with the VIVO cable is as good as the ETHER 2 gets – compellingly transparent performance. 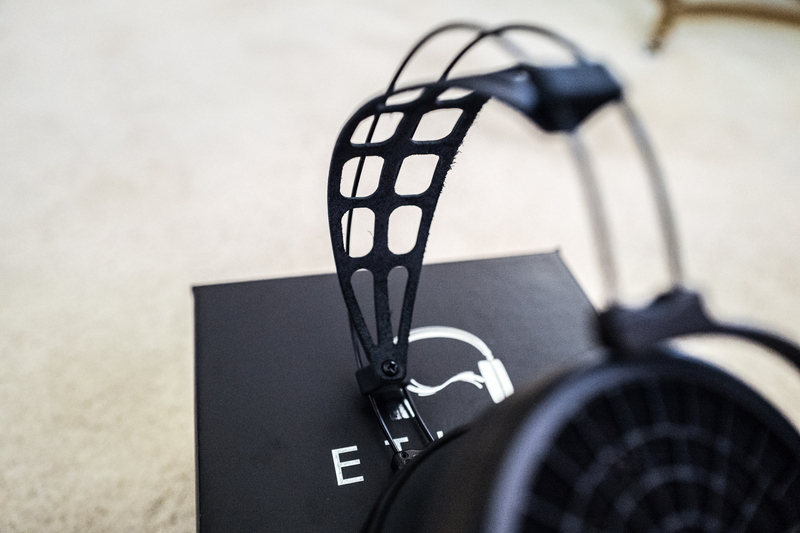 The ETHER 2 is surely one of the most tonally transparent headphones I’d heard to date. In a world where products are typically stereotyped into either the warm, bloom-y Audeze camp, or the clean, crisp Sennheiser camp, MrSpeakers’ latest flagship straddles the line brilliantly between timbral accuracy and technical performance – though to my ears, it favours the former by a hair. A light warmth is imbued in its signature, granting it its realism and organicity. But at the same time, it possesses a neutrally-positioned upper-midrange and an excellently-controlled bass region. The resultant response is an understated, uncoloured and life-like rendition of music; rare in an era where wow factor reigns supreme. But, that’s not to say the ETHER 2 isn’t a technical performer either. The ETHER 2 establishes its soundscape within an impressively stable, black background. Instruments come and go with precision and layering that could withstand an ensemble with ease. On my production Bila Hati Kita Lemah – which I recorded, mixed and mastered – the lead melody towards the end is shared by an electric guitar and pianos; weaving back-and-forth ala call-and-answer. Throughout my arsenal of in-ears and headphones, the hand-offs between the instruments were made most clear to me by the ETHER 2. I could tell with confidence when the guitar was retreating, or when the pianos were simmering towards the surface. In soundstage expansion – much like imaging precision – the chain is a key factor; track included. This’ll be discussed in the Synergy section, but I’ve found the ETHER 2 consistently delivers in the aspects I described above: Image stability, stage cleanliness and layering. A key contributor to this is speed. In both transience and decay, the ETHER 2 exhibits great snappiness – allowing it to maintain a rhythmic drive despite its laid-back top-end. Notes appear as if out of thin air and disappear into the blackness below. With select tracks however, energy around 8kHz or so may linger a touch longer and introduce some fuzz onto the soundscape. But it’s a situational occurrence that occurs less often than not. But, to achieve its realism and technical prowess, the ETHER 2 does make slight compromises. Unlike the first generation ETHER’s – the open ones, especially – the ETHER 2 lacks the vibrancy that granted them their charming musicality. While the ETHER 2’s subtle nuance and life-like neutrality speaks to my personal inclinations, they may not be preferred by audiophiles whose emotional fulfilment when listening to music comes from dynamism, contrast or bombastic-ness. The ETHER 2 is decidedly a laid-back sounding headphone. This isn’t because it’s muted or dull-sounding in any way – everything is simply balanced against each other; quality over quantity. There aren’t any egregious lifts along the mid-bass or upper-treble to incite contrast. So, whether or not that matches your preferences will determine your mileage. Nowhere is the ETHER 2 philosophy more realised than in the bass – truly, technically astounding. While industry norms dictate a rise around 100-200Hz to maximise presence, gusto and musicality, ETHER 2 takes the road less travelled – relying on high extension and low distortion; resulting in a bass as guttural and satisfying as it is transparent, balanced and controlled. Excellent coherence runs through the entire region, so the bass pumps like a singular, unified piston. And, that balance rings true on a larger scale as well. The bass exists on an equal plane with the midrange and treble to my ears, granting it an evenness deserved of the term reference plus a visceral quality sure to please audiophiles alike. In tone, the bass exudes naturalness as well. Although it blooms sparsely, the bass possesses a lightly warm tinge. This comes from the ETHER 2’s relaxed top-end and it works excellently with live instruments. Upright basses resonate with a hearty, woody, life-like timbre. Kick drums on all genres display great balance between the thwack of the beater and the thump of the skin. But again, neither are inhibited by the warmth they carry. Bass notes are constantly well-defined against the background, and identifiable in the busiest of mixes. Consequently, this low-end won’t suit those who prefer quantity over quality. Frequencies 200Hz and below may come across too linear for diehard bassheads. Nevertheless, the ETHER 2’s low-end truly deserves acclaim, by virtue of marvellous technical performance, physicality and timbre. The midrange is where ETHER 2 departs most from its predecessors. As mentioned previously, the ETHER 2 doesn’t have the same vibrance or liveliness, because of a dip spanning 3-4kHz. Consequently, it assumes a more reference profile – a midrange that isn’t plucky and musical at all times, but adapts accordingly to the music. Lady Gaga’s intro on Cheek to Cheek may sound a touch compressed, while Jennifer Hudson belts with divine force on And I Am Telling You I’m Not Going. Additionally, a bias towards the 1-2kHz region favours chestier instruments over others. Male baritones are livelier dynamically than female balladeers, violas carry more weight in a string quartet, and so on. But, this beautifully complements the piano for example, where the weight of the key stroke and the ring of the note are expertly balanced. Subjectivity aside, the 3-4kHz dip serves dividends in technical performance, realism and balance. Contrary to popular belief, a neutrally-placed upper-midrange – with relatively unemphasised projection or force – is how vocals should sound in a performance venue or hall. This is because the large majority of sound you hear is reflected, rather than direct; less in-your-face and concentrated than you might expect. The ETHER 2’s presentation therefore sounds more life-like and natural. And, it has technical benefits too. Because the lead melody isn’t overtly saturated or emphasised, the ETHER 2 is capable of pulling your attention towards the peripheral details – whether it be background instruments, minute, complementary noises, etc. This is again ideal in the studio where utmost balance, layering and transparency is necessary. Succinctly, the ETHER 2 excels in high-definition, undramatised realism; entirely up to you to love or hate. I expect the ETHER 2’s treble to be its most divisive attribute, and the irony is: It’s my absolute favourite bit! Shying away from trend, the ETHER 2 cleverly eschews instant gratification for a more understated, naturally-hued top-end. Online, I’ve seen this called dark, warm and laid-back, among others. But to my sensibilities, it definitively strikes neutral with a razor’s edge. The ETHER 2 possesses one of the most transparent treble tones I’ve heard, along with an authoritative, crisp and refined timbre that strikes me as eerily life-like. Drawing energy from 8-and-10kHz peaks, cymbals and hi-hats possess excellent attack; decaying with zero awkwardness, incoherence or lingering harmonics – interrupted only by pure blackness in-between. This to me is indicative of a reference-grade top-end in tone, texture and transparency. Technically, the ETHER 2’s top-end continues to impress. Extension is marvellous and so is speed. The two construct the headphone’s vast, stable and spherical soundscape. But ultimately, the treble’s transparency allows the track to define the image’s dimensions. There’s zero tomfoolery present to exaggerate stage expansion or detail pronunciation; a dream-come-true for professionals. Aside from the obligatory pockets of energy around the lower- and upper-treble, the top-end as a whole is stringently linear. Flashy is a term I’d never associate with the ETHER 2 and it’s truest here. Again, if you’re coming from transducers like Sennheiser’s HD800, Focal’s Utopia or MrSpeakers’ very own AEON Flow, you’ll probably miss some razzle dazzle. But, the ETHER 2 delivers something neither three can: An unabridged, unadulterated and yet-still-musical rendition of the truth. It’s a tuning with my utmost respect, but your mileage may (and will) vary. A well-balanced, reference signature: The ETHER 2 boasts an immensely level-headed signature, where every frequency range is balanced against each other. It’s neither warm nor bright; neither thick nor lean. This is ideal if you want the headphones to virtually disappear and give you an honest representation of the music or gear you’re listening to. An unsaturated midrange: One of the ETHER 2’s hallmark traits is its laid-back upper-midrange – a facet reminiscent of mastering in-ears like JHAudio’s Layla. Aside from technical benefits, it also offers a more life-like, spacious presentation, where vocal projection is relatively restrained – taking into account acoustical phenomena you’d hear in real life. Visceral, yet well controlled, distortion-free bass: The ETHER 2’s stand-out quality is its low-end. Despite how seamlessly it blends in with the rest of the frequency response – perhaps, by virtue of that as well – the ETHER 2’s bass is one of the most technically-capable and tonally-transparent I’ve heard. It won’t please diehard bassheads by sheer impact, but if you’re an audiophile with an appreciation for bass in cleanliness, texture and control, ETHER 2 will absolutely deliver. Pristine, crystalline clarity and air: The ETHER 2 has a linear upper-treble with zero peaks for crispness or clarity. While it greatly benefits coherence, refinement and timbre, it does render the headphone relatively laid-back in sparkle and air. If you’re more inclined towards the HD800S or MrSpeakers’ very own Aeon Flow, the ETHER 2 may be too calm for you. Pillow-y, euphonic warmth: The ETHER 2 does not satisfy the other end of the spectrum either. Aside from the density it draws from the centre-midrange, the headphone remains largely neutral in bloom and warmth. As its upper-treble is, the ETHER 2’s mid-bass is linear as well. 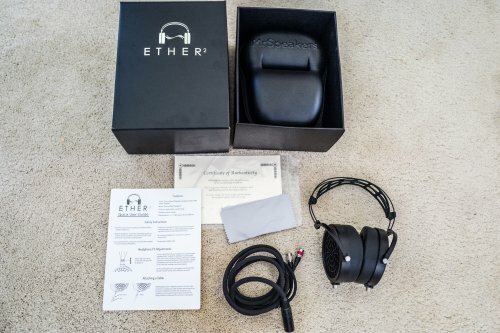 So, if you prefer Audeze-esque signatures, the ETHER 2 may not be for you. An exaggeratedly operatic sense of scale: The ETHER 2’s penchant for transparency extends to its spatial presentation as well. It adapts in terms of stage expansion, note size and imaging precision according to the chain, as well as the track. So, if you prefer the HD800S’s almost exaggerated sense of space and scale, the ETHER 2 won’t necessarily deliver that. Sony’s WM1A – relative to the Cavalli Audio Liquid Carbon we’ll discuss later – brings a warmer, more rounded, more intimate sound to the ETHER 2. The player possesses a lower-midrange bias, causing instruments to sound richer, fuller and more harmonic. Fortunately however, no articulation was lost up top. Cymbals maintain their crisp, clean shimmer and snares still crackle. However, the WM1A noticeably grants the ETHER 2 less dynamic range. Instruments don’t pop as much against the black background, resulting in less resolution and transparency. Imaging is also a touch narrower as a result. But, in the absence of a full-fledged desktop amp, I reckon the WM1A will get the ETHER 2 80% of the way there. 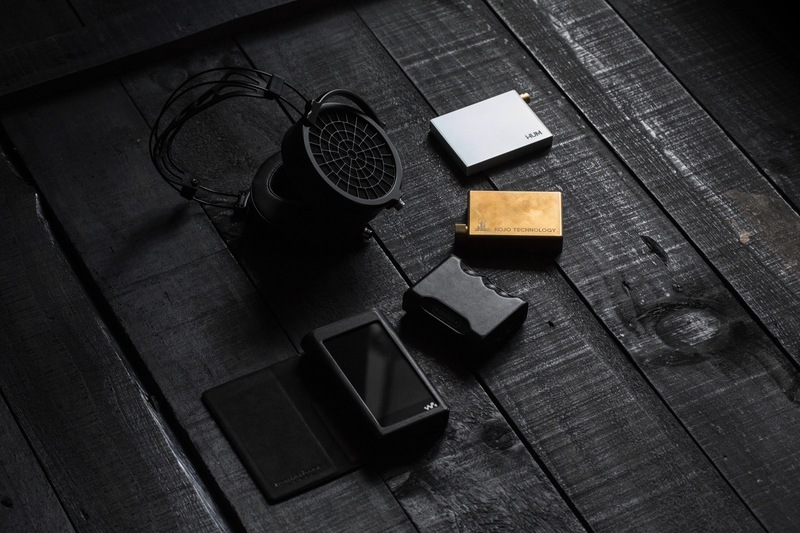 The KM-01 Brass is a Japanese, battery-powered, portable amplifier. Like the Sony WM1A, it possesses a warmer signature. But, the KM-01 is less bodied by comparison. The warmth it carries comes from the low-end, which takes a step forward in the mix in terms of lushness and impact. However, presence remains untouched, so the melody of the bass never oversteps the lead instrument. The treble gains headroom as well. Flourishes and nuances there remain just as punchy, but sound more refined and effortless. The KM-01 certainly has the hallmarks of a tube amplifier in tone. It certainly isn’t the most resolving or transparent of the lot. Its imaging isn’t the most precise either. But, if you want the ETHER 2 to sound more laid-back and euphonic, the KM-01 is certainly a viable alternative – especially when on the go. The HUM Hypno is a single-ended, battery-powered portable amplifier that drives the ETHER with ease at high gain. With the WM1A and Hypno combo, the ETHER 2 possesses a neutral tone, but shaves a bit of its body for a more precise, clinical sound. Notes sound more articulate than harmonic, which translates to higher definition and perceived clarity. In terms of headroom, dynamic range and transparency, I’d say the combo performs better than the WM1A on its own. 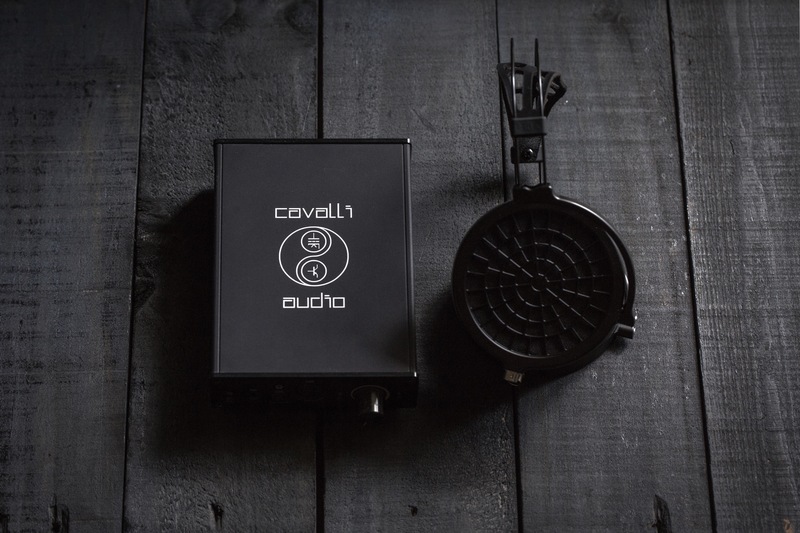 But, the stack still loses out to the Cavalli Audio Liquid Carbon. The Liquid Carbon produces more fleshed-out, complete instruments against a blacker background. But, it does so with less treble sparkle and pizzazz. The Hypno is an ideal portable option if you’re looking for near-desktop-class headroom, with more sparkle and liveliness in tone to boot. In sheer technical prowess, the Mojo is the strongest of the portable lot. In headroom, dynamic range and scale, it’s on the same tier as the Liquid Carbon – producing instruments with volume, vibrancy and authority. The only aspect where the Liquid Carbon has a clear edge is in soundstage depth. The Mojo’s upper-midrange has a distinct honky-ness to it that makes instruments sound perceivably more saturated. So, the Liquid Carbon sounds more refined and laid-back by comparison. Regardless, I think the Mojo is the ETHER 2’s most capable portable companion of the bunch. Thankfully, it isn’t affected as much by the Chord product’s unique timbre, resulting in a decent desktop-esque experience on the go. The Liquid Carbon is my go-to desktop amp, preferred for its refined and mature rendition of impact. It never fails to captivate with punchiness and energy, but it’s always complemented by authority and control. I think the Liquid Carbon is an ideal amp for the ETHER 2 in timbre. It injects just enough kick into the headphones without ever tipping it towards losing composure. In terms of imaging, there’s enough headroom to discern stage differences between tracks. However, I have a feeling the ETHER 2’s are capable of scaling further with higher-end amplifiers. I won’t be certain until I get the chance to try them. But, I can confidently say that the Liquid Carbon is beyond sufficient as far as drive is concerned. The UPG001 STD HP emphasises note definition and vocal forwardness, whilst retaining as much of the headphone’s inherent balance as possible. Relative to the REF HP, the STD HP doesn’t bring as much dynamic range – notes and micro-details don’t pop as vibrantly. However, this is ideal for those who wish for a more transparent, undramatised presentation. The midrange is now tipped slightly towards the upper-mids. Vocalists sound more present, vibrant and saturated. The lower-mids also take a step back, so those very instruments are perceivably more defined. However, this is to the detriment of note structure. Instruments – though still composed – sound less complete and balanced. All in all, the STD HP provides a shortcut of sorts towards a more intimate sound, though not the last word in technical respects. Brise Audio’s UPG001 REF HP brings a more dynamic, forwardly sound to the ETHER 2. The low-end carries more body and weight for a more guttural, grunt-y presentation. The upper-mids and treble are also a touch more energetic with increased sparkle and projection. As a result, the soundstage may be perceived as smaller, due to the amount of room that this occupies. In return, the REF HP brings higher resolution, clarity and micro-detail retrieval – livelier instruments against a blacker background. In all honesty however, the difference isn’t what I’d call night-and-day. And, whatever differences there are aren’t my cup of tea. This is a cable ideal for those looking for more liveliness and energy out of the ETHER 2. For those who are happy with a more transparent, reference signature, the VIVO cable is the suitable match. The German flagship is ETHER 2’s most immediate rival. Instantly, the latter strikes me as the more coherent, effortless and natural-sounding headphone. The HD800S becomes a tad disjointed in the treble, where it insists on pushing detail rather than sitting back with the rest of the frequency response. The Sennheiser headphone isn’t harsh by any means, but there’s a clear emphasis on brighter harmonics around 7-8kHz. Instruments have a bright edge to them with varying results. On one hand, transients are crisper and more defined. For example, on Dimas Pradipta’s 9 Grange Road, a rattling ching ring can be heard during a pause around the minute mark. This error (if it is one) is more obvious on the HD800S than it is on the ETHER 2. On the other hand, there’s an artificiality to the sound that the latter entirely evades. This effect extends to dynamic range as well. Because the HD800S’s transients are constantly excited and in-your-face, the headphone comes across less dynamic than the ETHER 2. Builds, cadences and drops come across with tons more drama and impact on the MrSpeakers flagship, because the energy of the headphone ebbs and flows in accordance to the music. The ETHER 2 maintains a blacker background as well, as its treble decays quicker with less harmonic haze. Another key contributor to this is bass performance. The HD800S competes surprisingly well with its light – yet speedy and punchy – jabs , but the ETHER 2 is the clear victor here. The latter’s arsenal of technologies gift it outstanding extension, resolution, authority and physicality, whilst exerting equal – if not superior – control relative to the HD800S. In terms of expansion and imaging, it’s neck-and-neck. The HD800S might expand a hair further, but the ETHER 2 posits denser, more full-bodied and more three-dimensional images. Instruments sound more palpable and corporeal. Although the HD800S fares well in this regard too, it does end up sounding a tad two-dimensional by comparison. The midrange, though, is certainly more apples-and-oranges. The HD800S is more exciting, vibrant and engaging, while the ETHER 2 is more even-handed, layered and deep. Again, those who prefer an airier, livelier, more detail-oriented sound will most likely prefer the HD800S. But, if you crave something more balanced, refined and transparent, I believe the ETHER 2 is the more mature headphone – a better reference in any studio or otherwise professional environment. Speaking briefly on ergonomics, the HD800S is the more comfortable headphone for me because of its far larger ear cups. It also distributes its weight more effectively, while the ETHER 2 is a tad side-heavy. The Sennheiser headphone is more breathable as well. But, it’s significantly more open too, which means it isolates far less noise than the ETHER 2. Comparing the ETHER 2 to the first of its ilk goes to show just how far Dan Clarke’s grown since 2015. Immediately, the ETHER 1.0 comes across as a punchier, more vibrant headphone; more brash and loud. It has a fuller, more forwardly sound owing to lifts around 300Hz and 2-3kHz. This heavily contrasts the ETHER 2, which dips around 3-4kHz – resulting in its laid-back presentation. But again, that dip has technical benefits as well. The ETHER 2 comes across more refined and restrained, which aids its dynamic range. 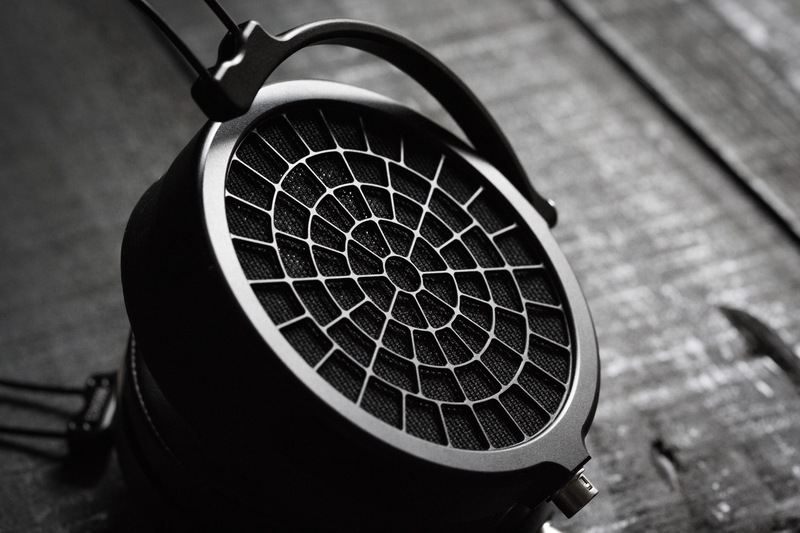 Similar to the HD800S – except in the upper-mids – the ETHER’s constantly saturated midrange inhibits micro-detail retrieval. Its successor is far superior in terms of headroom, transparency and resolution. ETHER 1.0’s loudness means it’s prone to losing composure, which the ETHER 2 never even comes close to. This is especially true when it comes to imaging precision. The ETHER 2 zips past its predecessor in this regard because of several aspects; first of which is linearity. Again, the ETHER’s penchant for vibrancy manifests in its lively, bombastic profile. The images it produces loom large, so much so that they overlap sections of the stage. As a result, you don’t get images that are as compact, tight and defined as those on the ETHER 2. Distortion plays a role in it as well. The ETHER 2 possesses a cleaner profile with stronger layering, micro-detail retrieval and separation – more effortlessly too. Nuances simply pop further on the ETHER 2 onto the forefront of the image. How it manages to achieve this dynamic range whilst maintaining a blacker, more stable background is most likely attributed to top-end extension and reduced distortion. Finally, comes the low end. The ETHER 2 has a more laid-back and controlled bass response, while the ETHER 1.0 opts for a more harmonic, yet less-defined response. Admittedly, this makes the latter more fun to listen to. Again, there’s a charming sense of cohesive musicality that comes from the ETHER 1.0’s more exuberant signature. But, when it comes down to strict technical performance, the ETHER 2 clearly triumphs – in spite of its more linear, true-to-life delivery. 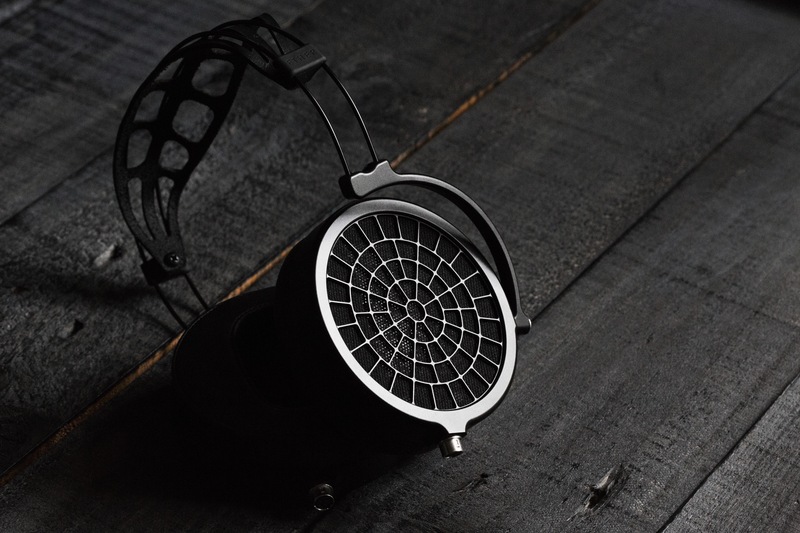 Between the ETHER 2 and the HD800S lies MrSpeakers’ AEON Open. The AEON Open’s tonal balance resembles the ETHER 2’s in many respects, including a neutral upper-midrange and an articulate (yet un-bright) lower-treble. However, the former departs from its flagship sibling in the lower-mids and upper-treble. The AEON Open has a leaner, more recessed lower-midrange, which gives instruments cleaner definition. Notes are more compact and biased towards the transient (i.e. the leading edge) rather than the harmonic. Additionally, a sparklier upper-treble gives the AEON Open a more exciting, dynamic sound with a more prominent sense of clarity. These two combined yield a presentation that can be succinctly described as crisp, clean and open. The ETHER 2 is relatively more level-headed; laid-back; less contrast-y. On the surface, the AEON Open might come across as not only the more exciting, exuberant headphone of the two, but the more technically-capable one as well. It’s certainly capable of delivering great, instant gratification by way of vibrancy and detail. However, closer inspection will reveal where the ETHER 2 has the upper-hand. Although the AEON Open performs quite excellently in separation, resolution and control (despite its loudness), the ETHER 2 proves victorious in effortlessness, transparency and imaging precision. Again, like in the ETHER 1.0, the AEON Open’s treble is so vibrant that instruments tend to overlap sections of the stage, resulting in less precise imaging. The ETHER 2 also has a much blacker background, because it supersedes the AEON Open in terms of bass control, top-end extension and overall coherence. Instruments sound considerably more uniform and information comes across much more effortlessly too. Ultimately, the most obvious differences between the two lies in restraint. The AEON Open is willing to sacrifice a bit of that in order to incite fun and contrast, while the ETHER 2 maintains strict discipline in order to fulfil its role as reference-grade headphones. This is no clearer than in the extremes. The AEON Open has a warmer, bloomy-er, naughtier bass response. It’s certainly fun to listen to, but there’s a clear compromise in definition, clarity and balance. The ETHER 2 fares immensely better in this regard. There’s far more complexity to the bass, it’s more transparent to the source – shifting in texture and tone from one track to another – and it extends further as well. 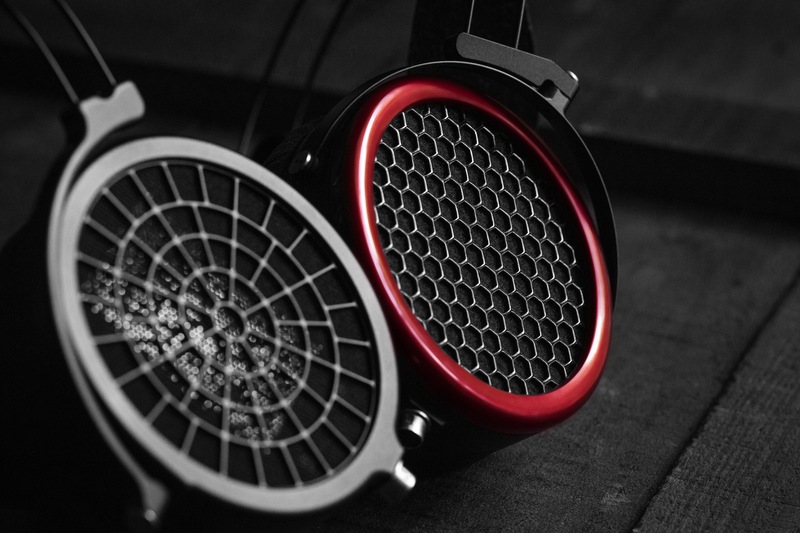 Up top, the AEON Open is HD800S-like with its brighter, crisper timbre. As mentioned previously, this means less composure, linearity and realism for more excitement and clarity. This is why the ETHER 2 comes across more natural, coherent and transparent. In terms of wearing comfort, the AEON Open takes the cake for me, because of its lighter construction, thicker pads and vertical length. It’s less tight on the head than the ETHER 2, mostly because the headband doesn’t have to extend all the way to achieve a great seal. Again, the ETHER 2’s near-perfect ergonomics are inhibited by lacklustre accommodation towards larger heads. But at the end of the day, this is but a small gripe that’s compensated for in durability and feel. MrSpeakers’ ETHER 2 epitomises reference-grade; uncoloured, undramatised and pristine in all respects. In an era where wow factor reigns supreme, Dan Clarke and co. have crafted a headphone with a stunningly clear voice – one that lets the music do the talking. Despite how innately it belongs in the professional’s toolbox, the ETHER 2 is compelling for audiophiles as well. Its low-end is one of the most defined, resolved and balanced I’ve heard; as mesmerising to listen to on kick drum stems as they are on Top 40 bass drops. The midrange offers a peak inside the vocal booth with zero fluff. And, the treble is as refined as the intricately-layered soundscape it occupies. Paired with top-class comfort and build, it makes the $2,000 pill just that easier to swallow. It’s not for everyone; nothing is. But – coming from an engineer – if all you want to hear is music in its purest, most unadulterated form, the ETHER 2 truly sits at the top without close contest. Empyah, zappazappazappa, Phantaminum and 1 other person like this. A few weeks ago at an audio event in Los Angeles, I was sitting at a table with Dan Clark and Andy Regan of MrSpeakers and we were treated to a wonderful live jazz ensemble performance. While talking about sound signatures of headphones in general, Dan suggested that I close my eyes and really listen to how the live drums and piano actually sounded. Natural, silky, and smooth were the immediate things that came to mind and as we continued to talk about the Ether 2, it became clear that Dan’s design goals were to create a sound signature that would be as close to live music as possible while enabling users to enjoy their music over long listening sessions and without ear fatigue. For those not yet familiar, Dan Clark is one of the busiest guys in the high-end headphone audio industry. Over the past several years, MrSpeakers has had a string of groundbreaking products that started with the MrSpeakers Mad Dog headphone in 2012, a heavily modified Fostex T50RP that retailed for $300. Even then it seemed apparent that Dan’s vision was to bring headphones to market that would present a musical, engaging, realistic, and comfortable sonic experience while at the same time delivering fantastic value to us, the audio enthusiast community. 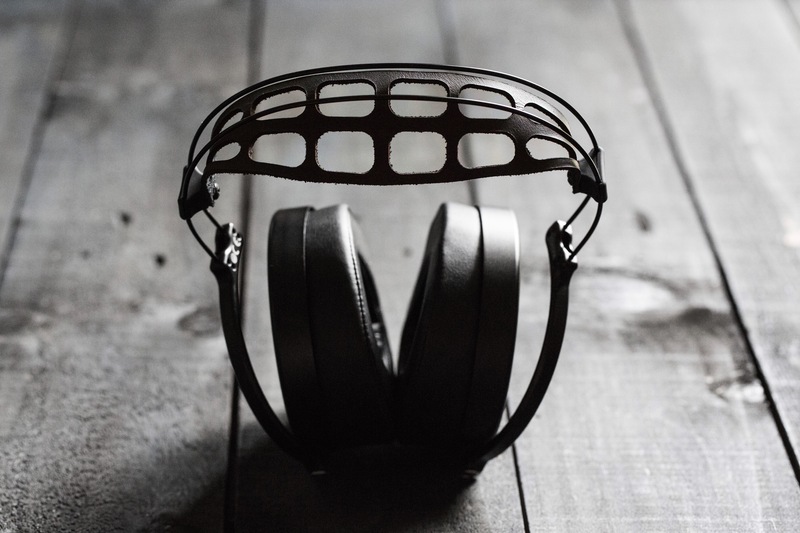 Over time, MrSpeakers continued to push the envelope and do extensive work on earpad, headband, and driver design, as well as his first foray into 3d printed ear cups with the Alpha Dog, called the Super-Cup. 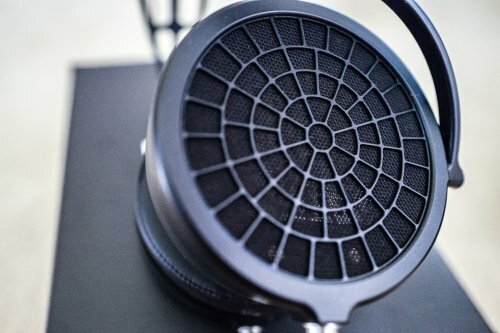 The 2013 released Alpha Dog retailed for $600 and continued to showcase MrSpeakers as a strong value proposition in relation to competitive products by other more established headphone manufacturers. It would be followed up in 2014 with the Alpha Prime, a further enhancement of the Alpha Dog which would be MrSpeakers last headphone that still used the (heavily modified) T50RP planar drivers. Cue the Ether. The MrSpeakers Ether was released in 2015 and was the first MrSpeakers headphone completely built from the ground up utilizing all of the knowledge gained with its previous modification and design work. 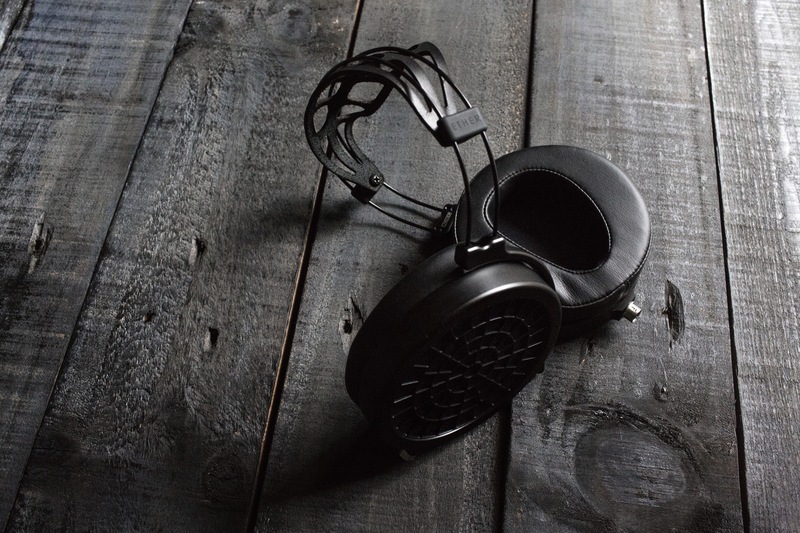 The Ether (open) and Ether C (closed) were runaway hits and firmly established MrSpeakers as one of the premier high end headphone manufacturers. 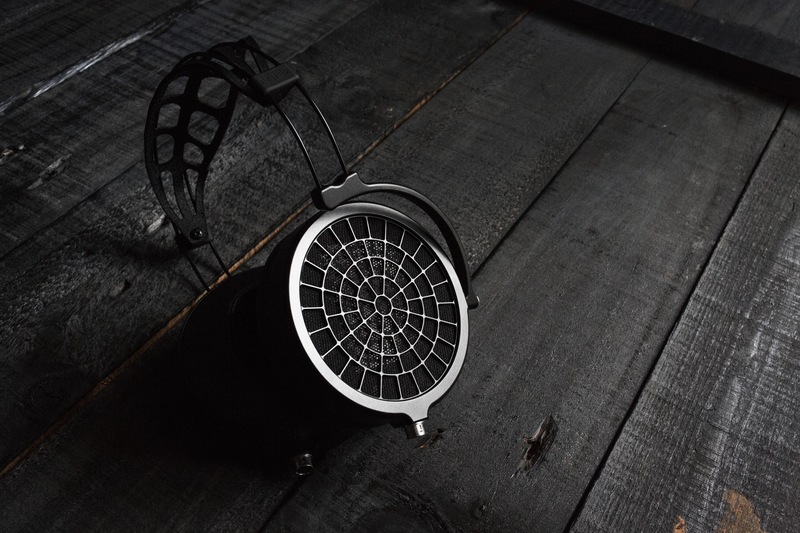 The $1500 Ether was now a direct competitor with planar offerings from Audeze and Hifiman, as well as the Sennheiser HD800, the neutral reference headphone of choice for many. The Ether’s sound signature could generally be described as a reference, neutral type of sound, which many enthusiasts at the time felt combined some of the best attributes of the Sennheiser HD800 in terms of its highs and the Hifiman HE-6 in terms of its bass response and overall physicality. 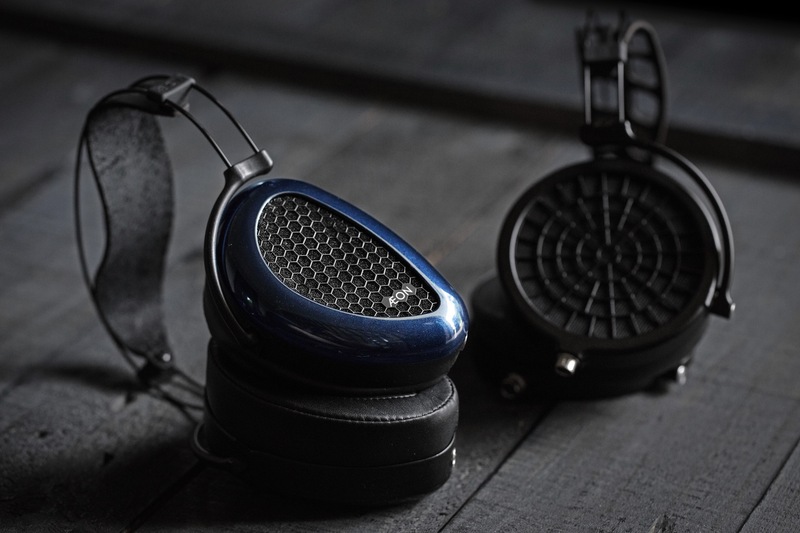 More importantly, it was perhaps the first direct competitor to the HD800 that could provide some of the HD800’s core sound signature characteristics, with the addition of an enhanced bass response, one of the niggling points of critique with the HD800. Since the release of the Ether, Dan and the MrSpeakers team have been hard at work with subsequent Ether Flow and AEON releases, existing headphone model upgrades, and notably in 2018, the release of the VOCE electrostatic headphone. Much of the design and development work on the VOCE was able to trickle down to the Ether 2. The Ether 2 was released in late 2018 and is now the flagship planar magnetic headphone from MrSpeakers. 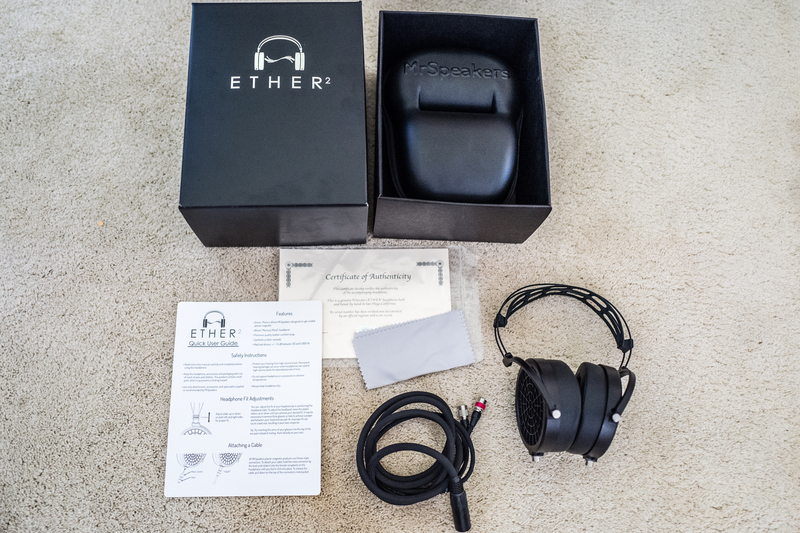 The Ether 2 comes packaged in a branded Ether 2 box along with a Quick Start Guide, microfiber cloth, and Certificate of Authenticity with the headphone serial number. The headphone itself comes in a black hardshell carrying case, a welcome and useful addition that I wish more headphones manufacturers would provide in the box. In terms of overall packaging, think practicality over luxury. One of the first things to notice when first picking up and handling the Ether 2 is the weight. Or rather, the lack of it. 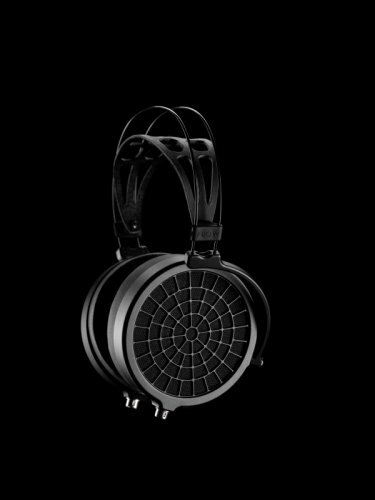 This is one seriously light headphone, coming in at 290 grams or 90 grams lighter than the most recent incarnation of the Ether family, the Ether Flow. The Ether 2 shares much of its design DNA with the electrostatic VOCE and is immediately noticeable by the “spider web” ear cup grilles and headband. The matte, all-black aesthetic gives it a very lean and stealthy look. Very cool. 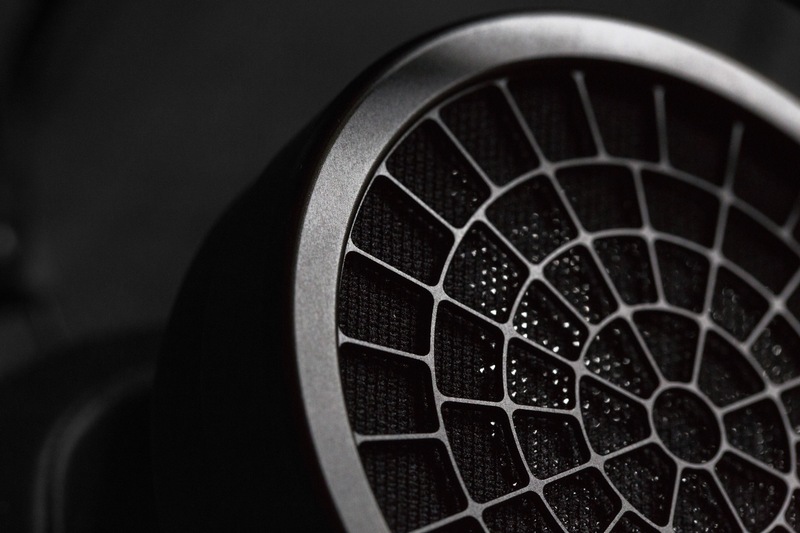 The headphone has an all-metal headphone ear cup, headband, and a carbon fiber driver baffle. The feeling of the headphone earcups in hand is quite special, as it’s an incredibly smooth texture that just feels “right,” for lack of a better term. 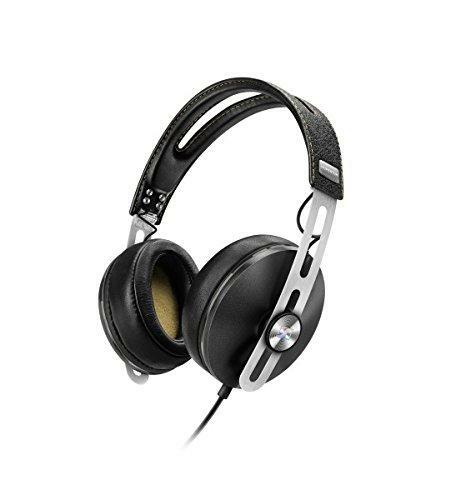 The headphone uses the same flexible NiTinol memory metal for its headband along with a perforated leather strap. While providing a large range for optimal fit, those with very large heads might find the head strap and memory metal touching at the top of the head without any space in between. Additionally, there is a fairly high level of clamping force from the memory metal wire which might reduce the comfort level for those with larger head sizes. The earpads are made of synthetic leather which looks and feels of high quality and feels like a slightly stiff memory foam. And while these can get a little warm after extended use, it never got to the point of being uncomfortable. The ear pad openings are angled and are large and deep enough for a fully circumaural fit for my slightly larger than average ear size. 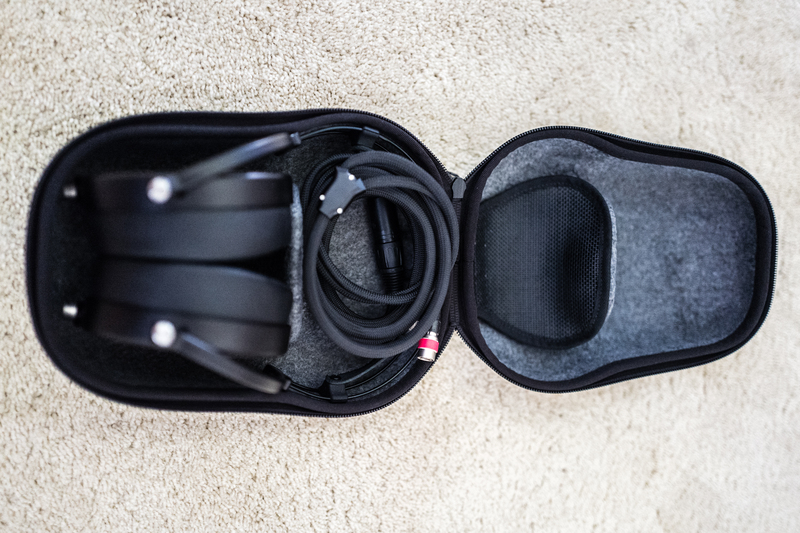 Overall, the comfort level of the Ether 2 is excellent and among the more comfortable headphones I’ve used. The main system used for reviewing the Ether 2 is the Sonore microRendu/Uptone Audio LPS-1 running Roon Server into a Chord Hugo 2 DAC and Benchmark HPA4 headphone amplifier along with the supplied MrSpeakers VIVO headphone cable terminated in 4 pin XLR. The Ether 2 was burned in for around 100 hours before any critical listening was done. At very first impression, the Ether 2 can come across as smooth and dark. Perhaps overly so. However, after a short period of time the brain adjusts to the sound signature which I feel it can best be described as neutral, musical, and natural. While the soundstage is not the widest or deepest, the presentation is full-bodied, with excellent resolution and a mostly linear response that accentuates the Ether 2’s exceptional bass texture and slam. This in turn has a warming effect which gives the Ether 2 its smooth and musical sound signature and prevents it from sounding clinical. As such, these headphones have little to no sibilance and can be comfortably used for very long listening sessions without fatigue. The highs are silky smooth with vocals sounding realistic and textured. Resolution and dynamics are also excellent with instruments sounding lifelike and not overdone. The Ether 2 represents a significant step forward in the MrSpeakers brand trajectory by continuing to push the performance envelope while also being made available at a sensible price. It’s simply a fantastic all-around TOTL headphone that sounds natural, combines musicality without the loss of technicalities, and has a stealthy design aesthetic that’s not only visually appealing, but one that gives the user a feeling of using something uniquely special. This one just sounds (and feels) right. Empyah, x RELIC x, PacoBdn and 10 others like this. Dan Clark of MrSpeakers fame never seems to rest. He is always working harder to build on his former success and make something better. An ambition for perfection might seem a fool’s errand, but it’s often where greatness can be achieved. To be honest, when Dan told me that he was working on ETHER 2, I didn’t exactly think it was his greatest brainchild (sorry Dan). First of all, the original is an amazing product in its own right. I wondered just how much improvement he would be able to make in a successor and honestly whether or not people really wanted an ETHER 2. And then he called me up one day to give me the particulars of ETHER 2. New design changes would be present where ETHER 2 borrowed the single pivot point technology from Aeon. I remember that call well and musing to myself, “damn, that’s smart and it makes perfect sense.” Single pivot point has better reliability and would be easier to manufacture. Dan went on to reveal that the design changes would yield additional benefits. A key result would be that he could lower the curb weight of the headphone by approximately 50 grams. Now that really had my attention. The production model actually went considerably lower than that 50 gram reduction coming in right at 288 grams total (minus the cable). This is remarkable to me. The weight of the Audeze LCD series is laughable to me, tipping the scale at nearly two times the weight of ETHER 2. Why anyone would want to wear something weighing almost a pound and a half is beyond me. Audeze doesn’t even publish the weight of their LCD line under the specs on their website…shameful. ETHER 2 is literally weighs in at half as much. Additionally, the ease of manufacturing ETHER 2 would likely allow to keep an aggressive price for this headphone. It was at this juncture of the conversation that I began to appreciate the scope of just how special ETHER 2 could be. Even back in the day when Dan was cranking out Mad Dogs from his garage for a measly $300, I remember that he was always respectful of the cost of his products even when others were charging many times more. Dan seems to have retained his early days appreciation for the cost of his products and is always maneuvering to keep prices low and reasonable. I appreciate this. Heck, we all appreciate a good deal and when price/performance works more in our favor. Now, what about the sound. Does it deliver the goods? I’m going to call the EHTHER 2 a rather bold departure for MrSpeakers from their typical “house sound.” I really enjoyed the original ETHERS and they are still a fine product. But, for me they always needed the tuning pads or EQ to get to where I was happy with the signature. The originals could at times be lacking for warmth and body. Plugging in the ETHER 2, I was shocked at what I heard. No EQ or tuning pads needed whatsoever! 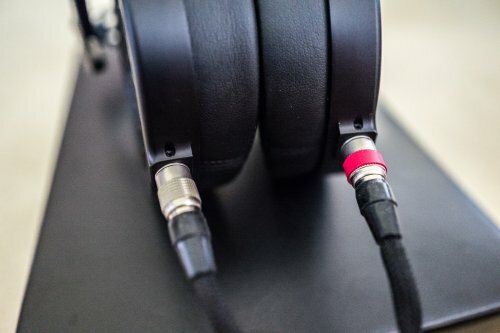 The sound of this headphone was warmer, smoother and at the same time more resolving than anything that I’d heard from MrSpeakers before, even more so than Aeon Open. I don’t like to use the word “natural,” but it does come to mind when thinking of descriptors to tag the ETHER 2. There is just no harshness or strident sound coming from the ETHER 2. Another big change is improved sound staging. Both width and depth are improved over previous ETHERS, extending well off the shoulder during my listening sessions. There are a few aspects of this headphones signature that I’d like to call significant. The first is the manner in which ETHER 2 reproduces bass. The sub bass on this headphone is flat down to almost 10 hz. Wait…did MattTCG just say flat down to nearly 10 hz? Oh yes, I did. You might want to label ETHER 2 an audiophiles basshead dream. The bass is just phenomenal in its ability to maintain texture and integrity down to a ridiculously low level. Please don’t misunderstand me here. This is not a th900 where the bass on all source material is jacked up. The bass here is linear to the recording. Put on some electronic music that features real sub bass and hold on to your seat. I’ll have to harken back to the release of the original lcd-2 pre fazor to conjure the feeling I got with ETHER 2 when I first put them on and cued up the music. The lcd-2 was fairly strong down to around 30 hz or so but it was somewhat “one note” with those frequencies and slightly murky. The bass with ETHER 2 goes lower and is much more textured. If you’re thinking that ETHER 2 might be a one trick pony, you’d be wrong. This headphone offers the best sound stage from a MrSpeakers headphone to date. Room acoustics come across very realistically. Notes decay nicely and trail off from the front to the back of stage convincingly. The stage is spacious. And while not hd800 spacious, it’s still a nice improvement over previous ETHER headphones. Next, if you’re into dynamics you’re going to love ETHER 2. The ability of the transducer to go from delicate and detailed to big and bold happens shockingly fast…almost estat fast. ETHER 2 can punch hard and effortlessly even at moderately low volume levels. If you are a fan of the hd650 but want more sub bass and better resolution, then I imagine that you’d very much enjoy this headphone. If you always wanted a totl Audeze headphone but found the comfort and quality lacking, then you would very likely be a fan of ETHER 2. If you like the resolution and fine detail of the hd800 but find it too thin and lacking warmth and bass response…you should try ETHER 2. If you think that the hd800 on a Magni 3 has plenty of warmth and bass response, then e2 might not be for you. 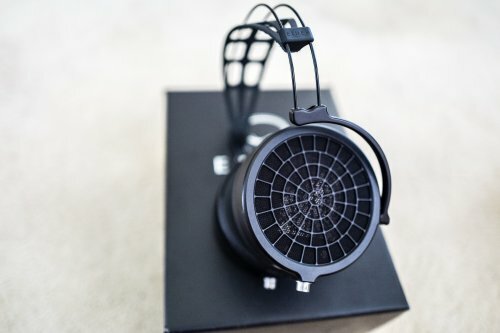 If you are not a fan of the “planar sound,” that probably won’t change for you with this headphone. Some people are drawn to the sound of a dynamic drivers. I can appreciate both. This is an exciting time to be in the headphone hobby. Reflecting back on the past 20 years in the hobby there have been headphone releases that were truly significant in that they helped to define the hobby and helped to advance it. Often these “special” releases proved what was possible with the type of signature they rendered. 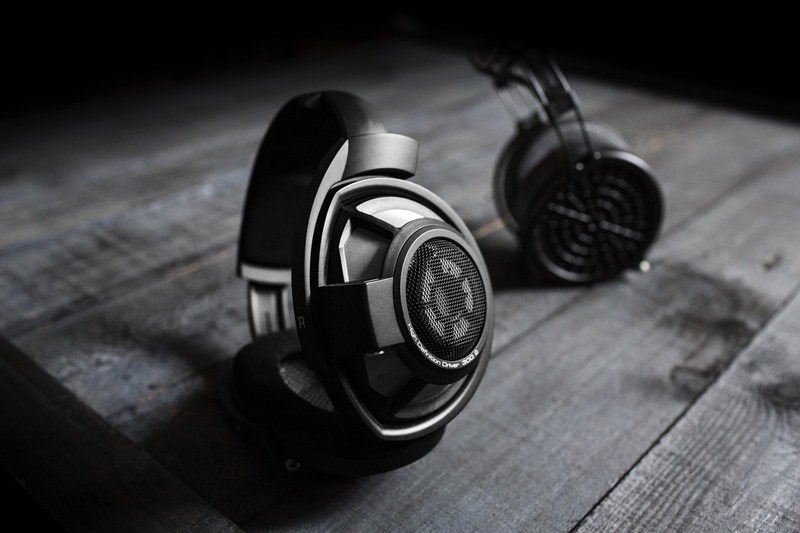 One such company that has led the way in helping to define the hobby is Sennheiser. 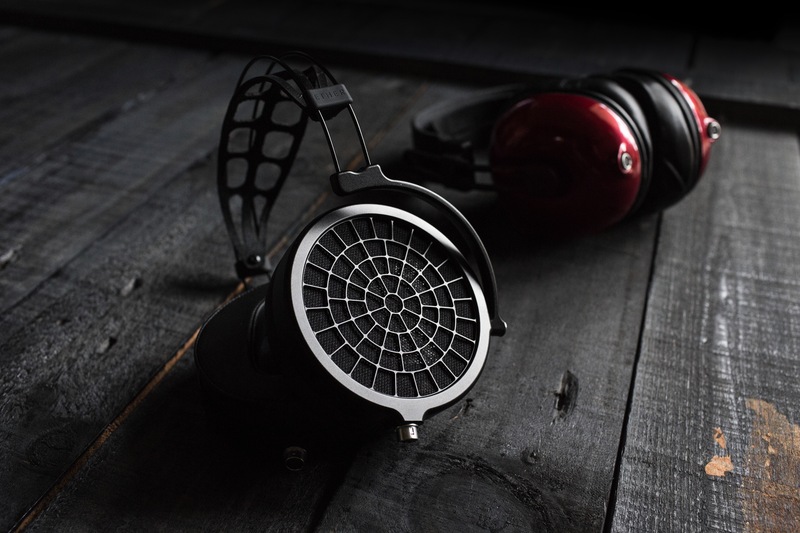 With products like the hd90 (Orpheus), hd650, hd800 and many others they have made generational contributions that shaped the concept of what was possible in the hobby. 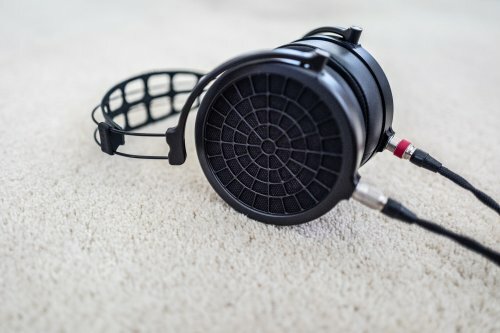 Looking, listening and considering what MrSpeakers brings to the table with ETHER 2, I would put this release in the category of “important and significant.” And a contribution that will help to shape the hobby. There are technical aspects about the build of this product that are truly noteworthy. The build that results in a curb weight of 288 in a planar magnetic flagship is a substantial contribution. 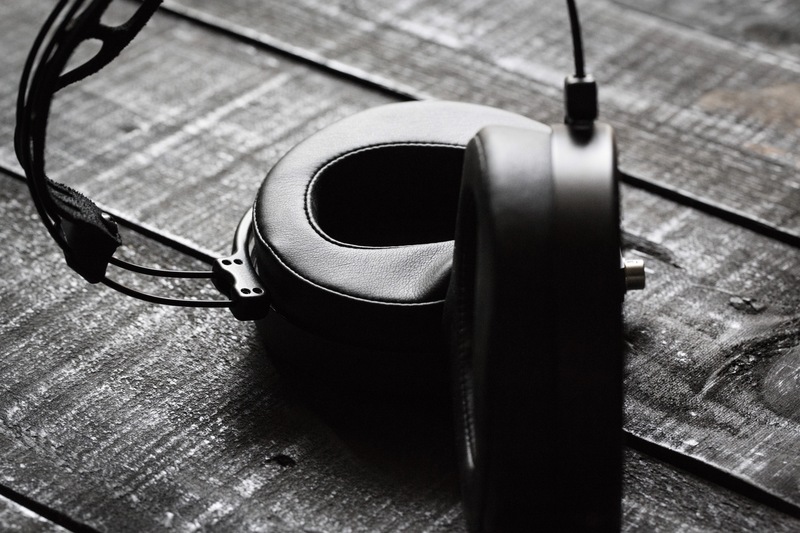 It shows that flagship headphones, even of the planar magnetic variety, don’t have to weigh a pound and can be worn comfortably for hours at a time. 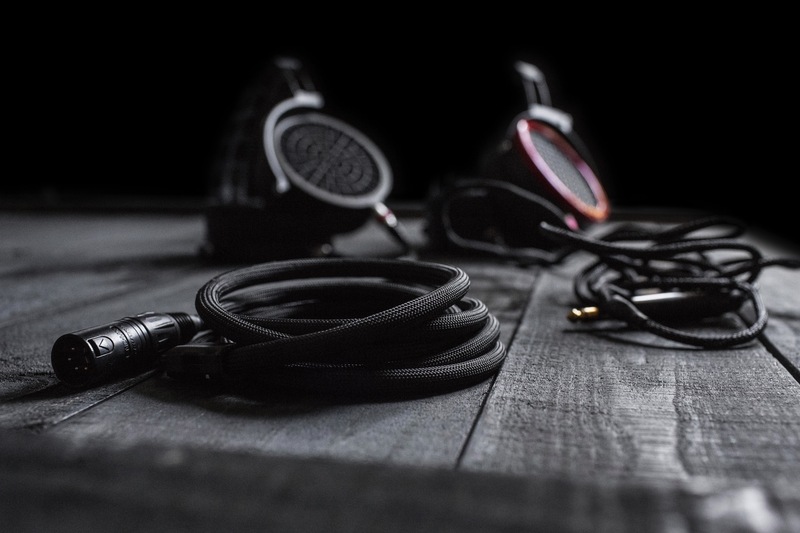 Consider the hd800. I’ve always found the ergonomics and comfort fairly good for long listening sessions. The ETHER 2 is almost 100 grams lighter than the hd800. And then there is the sound. When I think about the sound coming from ETHER 2, the words haunting, and addictive come to mind first. The way that it renders music gives me an instant emotional connection to music. That sense of connection is the very reason that I’m in this hobby. It is the very reason that I listen to music at all. 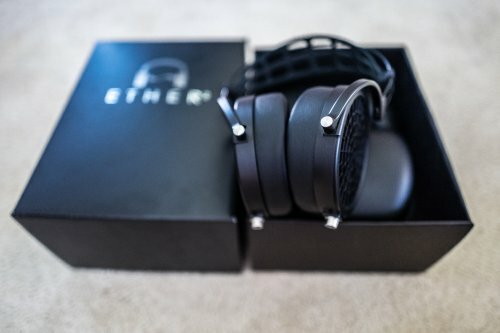 ETHER 2 has given me the most enjoyable, straight out of the box, plug and play experience I’ve had since I’ve been into headphones. It renders music in a manner that is simply ethereal. For me, it offers an experience that might be more comparable to a good set of speakers than anything else. At the very least e2 is “speaker like” in its ability to render sub bass and it’s ability to be transparent to the source material. Pictures will be posted shortly and driver specifications and graphs will follow after that. Empyah, PacoBdn, Odin412 and 35 others like this. @MattTCG Really interesting review! 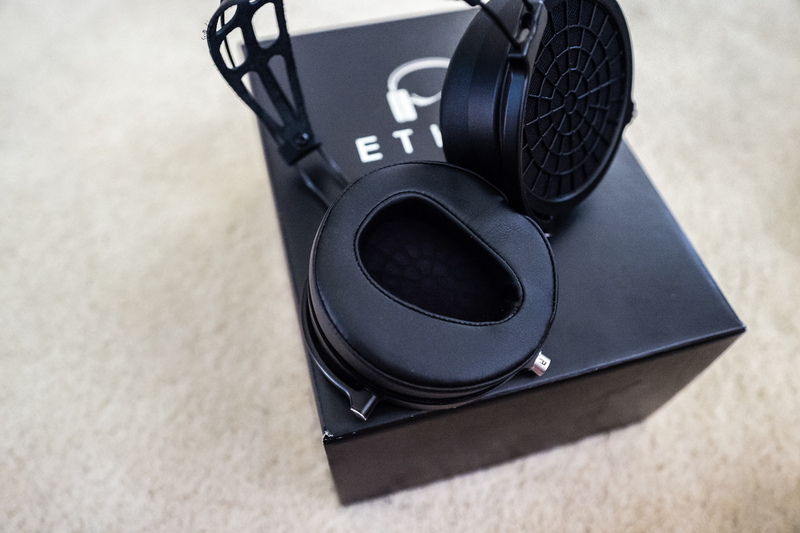 Compared to other TOTL headphones, how do you think the Ether 2s stack up to them? Finally a flagship headphone under 300g. I hope others will follow. Great pioneering.